For many low-income families in Gallup, New Mexico, the tax refund they receive at the beginning of the year can help make ends meet and pay for important expenses. Unfortunately, tax preparers look forward to those tax refunds, too – and to siphoning off a portion of a taxpayer’s refund for their own profit. Research that First Nations Development Institute (First Nations) conducted in 2012 documented a range of unfair, deceptive and abusive financial practices conducted by tax preparers in the city of Gallup, which borders the Navajo Nation and where nearly half the population is Native American. During the 2012 tax season, First Nations conducted mystery shopper visits to tax preparation firms in Gallup and other New Mexico border towns. We documented a range of problems with tax time loans, including steering people toward high-cost, refund-anticipation loans or check products when a simple deposit into a bank account would have saved the taxpayer money. More significantly, First Nations documented one case in which a taxpayer was extended a loan against her tax refund even though the company had already received the tax refund from the IRS. “They gave her a loan against money that was rightly hers, and didn’t bother to tell her that her refund had already been paid to them by the IRS,” shared Shawn Spruce, a consultant and taxpayer advocate who conducted the mystery shopper visit with the taxpayer. “We suspected that it wasn’t an isolated incident and contacted authorities.” A single mother with three dependents, the taxpayer eventually filed a complaint against the company through the New Mexico Office of the Attorney General. The Consumer Financial Protection Bureau (CFPB) is a federal agency that helps consumer finance markets work by making rules more effective, by consistently and fairly enforcing those rules, and by empowering consumers to take more control over their economic lives. First Nations shared our mystery shopper reports with key investigative staff at the CFPB in the spring of 2013. “We appreciate First Nations for bringing their report to our attention. The report was troubling and the bureau’s investigation confirmed many of the findings,” stated CFPB’s Samuel Gilford. The CFPB has the ability to subpoena records from financial firms if they suspect a pattern of potentially illegal activity. On April 14, 2015, the CFPB announced that, together with the Navajo Nation, it is taking action against S/W Tax Loans, Inc., a company that they claim operated an illegal tax-refund scheme. 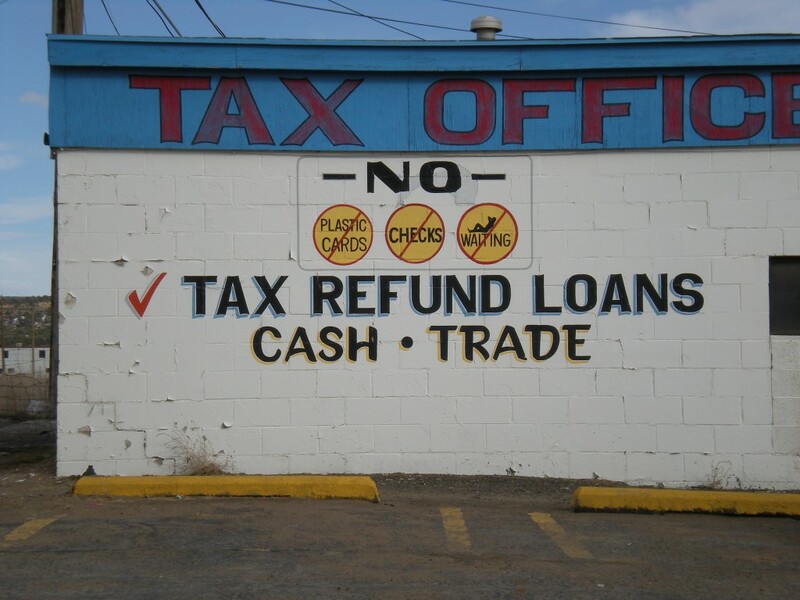 The scheme was based on tax-preparation franchises steering low-income consumers, including many citizens of the Navajo Nation, toward high-cost refund-anticipation loans. A proposed order, if approved by the court, would result in roughly $438,000 in total consumer redress and require the defendants to pay $438,000 in civil penalties for their unfair, deceptive and abusive practices. The complaint states that the tax-preparation firm illegally steered vulnerable consumers to high-cost products and illegally and grossly understated the loans’ annual percentage rates. Most importantly, the complaint alleges that the tax firm unfairly failed to disclose the availability of consumers’ tax refunds. They failed to disclose to more than 1,500 consumers that their tax refunds had been received from the IRS and were already being processed by the company. Instead, when these consumers inquired about the status of their refund, they persuaded the consumers to take out a second or third refund-anticipation loan. As a result, many consumers were led to pay a substantial finance charge for an unnecessary high-interest loan.